Salad has a bad rap. But sometimes it’s for a good reason. Recently, Matt and I were out at lunch and ordered a large salad. When our salad came it was overly sweet, decked out with fruit and a fruity dressing and was tossed with wimpy lettuce. Typically when I order a salad out at a restaurant that serves standard fare, I end up fairly disappointed. In our house, salad is a MEAL. And it most definitely isn’t sweet. I’m talking a huge gorilla bowl of mixed greens with avocado, olives, chopped vegetables and kimchi tossed with a light oil and vinegar dressing. The flavor is deep and each bite is satiating and more over it’s ridiculously simple to put together. Salad, salad, salad, salad, salad, salad, salad, salad, salad, salad, salad, salad, salad. Which is why I’m so excited to share this recipe with you today! This plant-based Salad Nicoise is a hearty take on a french classic that will turn any non-believer into a salad fanatic! In fact, this dish has already had it’s 15 minutes of fame as the Meatless Monday feature in the national Humane Society Newsletter. It’s wonderful in the summer when you’re looking for a heartier meal that isn’t heavy or one that you’ll regret later (I’m looking at you vegan mac and cheese). And, it’s wonderful in the winter when you’re craving something fresh that will still fill you up. The recipe features hearty vegetables such as asparagus and artichoke hearts as well as a tangy, creamy mustard dressing. It takes a little bit longer to prepare than a traditional salad, but the result is more than worth it. Feel free to substitute the fresh veggies in the recipe for frozen. i.e. frozen, defrosted green beans instead of asparagus. Place cashews, lemon, olive oil, water, garlic, coarse and Dijon mustard, salt and pepper in a high-speed blender. Blend until smooth, scraping down the sides as needed. Pour dressing into a bowl and stir in the chopped parsley and basil. Season both the potatoes and asparagus with a pinch of salt and pepper. 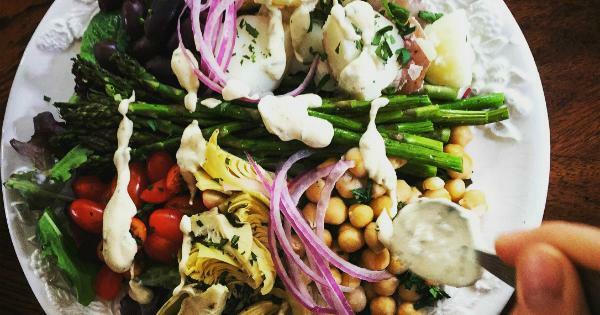 Make a bed of mixed greens and top with potatoes and asparagus, artichoke hearts, chickpeas, olives, tomatoes and red onion. Drizzle on creamy mustard dressing.